Ramona Denby-Brinson is a professor and associate dean of research for the College of Public Service and Community Solutions. She’s leading an effort to expand research efforts within the college and strengthen ties throughout Arizona State University and the local community. “When you look at the people that are here--the expertise, the professional backgrounds, the diversity in research portfolios, it is apparent that there exist a tremendous amount of knowledge and capacity. We are perfectly positioned to grow collaborative partnerships within schools, across centers, and throughout the larger university. I look forward to helping to spark greater connectivity and to organizing science teams that will enable us to tackle some of the tough issues our communities face,” said Denby-Brinson. Her curriculum vitae is tailor-made for the job. Denby-Brinson spent the better part of the past 20 years in progressive positions at the University of Nevada Las Vegas (UNLV). She taught as an assistant professor and coordinated the School of Social Work’s undergraduate degree program. She became associate dean for research in the Greenspun College of Urban Affairs and director of the University’s Center for Urban Partnerships. Denby-Brinson served as chair of UNLV’s Institutional Review Board for social and behavioral sciences. The past six years, she was a senior resident scholar at UNLV’s Lincy Institute, supervising and supporting research that sought to improve Nevada’s health, social services and education. Since late June, Denby-Brinson has been meeting with faculty and becoming more familiar with the work of the two dozen research centers within the College of Public Service. She sees her role as helping researchers and faculty conduct research with national relevance that will help them reach their long-term career goals. Denby-Brinson plans to work with faculty to make sure they incorporate their research into what they teach in the classroom. A firm believer in the “theory-research-application bridge,” Denby-Brinson anticipates a role in which she can be the catalyst to expand the integration of real-world research into classroom settings. Denby-Brinson noted that another one of her goals will be to expand faculty research involvement among those communities that can greatly benefit from such partnerships. In doing so, she hopes to engage faculty in thinking about different ways to measure and communicate the impact and significance of the research that is being done between the College of Public Service and Community Solutions faculty and the communities that they serve. Her own research focuses on studying children and families involved in the child welfare system. She’s particularly interested in highly vulnerable youth, including those who are challenged by profound mental health issues and involved in such institutional settings as juvenile justice and the broader child welfare system. “I study large social systems and the impact on vulnerable youth,” said Denby-Brinson. “At UNLV, we did a lot of large scale, multi-partner demonstrations where our aim was to test the efficacy of various interventions and service approaches and then upon discovering “what works,” organize the efforts of various stakeholders, policymakers, and funders to sustain implementation measures and track long-term impact. Public service has always been a part of Ramona Denby-Brinson‘s life. Her mom was a teacher. Her dad, a cop. Most of her nine siblings are also in public service as ministers, teachers and police officers. 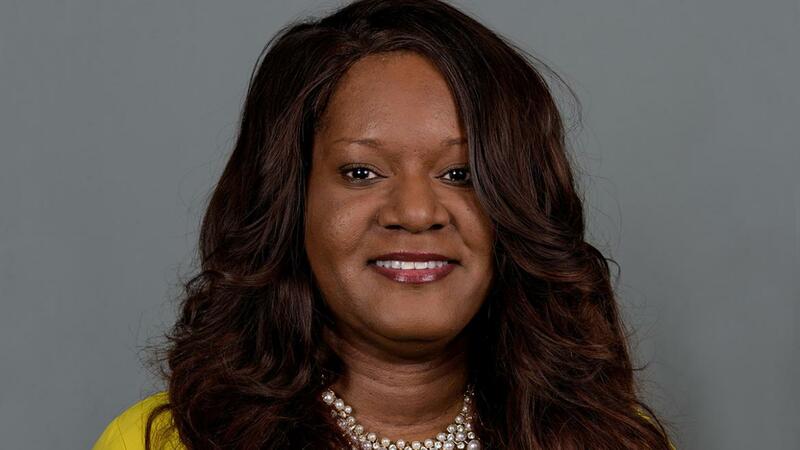 The Las Vegas native became a licensed social worker after earning her bachelor’s degree from Arizona State University in 1989 and a Master of Social Work the following year from UNLV. She served as a medical social worker and deputy public guardianin Las Vegas before pursuing her Ph.D. at The Ohio State University. Denby-Brinson is also a proud parent of two sons, ages 11 and 19 and one daughter, age 12.